We adopted Fergus (he was Heywood at PBS) in January 2008. Not only did he help heal our heartbreak of losing our beloved cat Hasenpfeffer, but he iinstantly became a member of our family. He is funny and loving and entertaining and attentive. And...when we got his vet records after the adoption we learned he was a Katrina kitten from New Orleans, originally rescued by ARNO. Considering where he started his life we feel double lucky to have him! 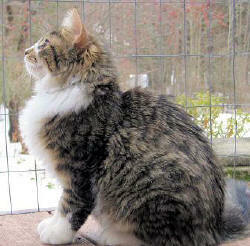 When we met him at the shelter we were taken with his clear, bright green eyes, his charming marking (he has a goatee!) and his soft, soft fur. He had the sweetest temperament and purred and purred, We just knew we had to adopt him. We have two rescue dogs (Jack and Milo); Fergus is their new best friend. The moment we brought him home we knew that there was going to be a special bind between Jack, Milo and Fergus. The three boys wrestle and play and curl up together everyday. All three of them meet us at the door in the evenings and beg for food while we are cooking. We haven't found anything Fergus won't try! We are attaching a photo we took his first week with us. As you see he is quite settled in. We love Fergus and are so grateful for the loving and humane work PBS does. Without PBS we wouldn't know the joy that Fergus has brought into our home. 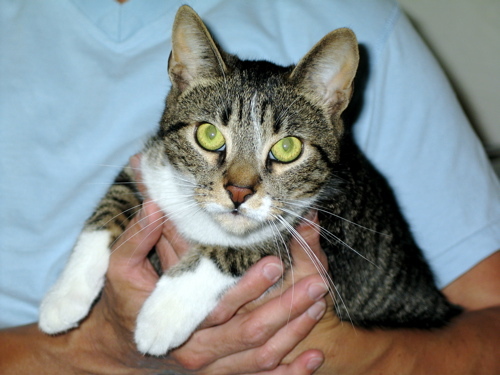 I was known as Tina when Priscilla brought me up north to the Pat Brody shelter in September 2007, where she found me in a shelter in New Orleans. I was only with Priscilla and the other kitties for a month before mommy and daddy saw me and said that they found the perfect little girl for their home. Because I was still under a year old, and I had already had a litter of kittens in LA, I was really scared to make such a big move. When I entered my new home it seemed so big. I was very shy and it took me weeks to come out from under the sofa and begin to explore. However, once I started to roam I found that there were no cages or fences and I don't have to share my food with the other kitties. I no longer worry about having to make my way on the streets of a storm-devastated city. I get to stay inside where it is always warm and dry and do what I love best--sitting in the windows to catch a sunbeam, watch birds and deer, and would you believe, even snow. l love to snuggle up with a blanket and play with mommy and daddy and all my toys. I certainly have found a good life!!! Here is a picture of our little girl, Lindy, in "her" chair with one of her favorite toys. She is a delight and one of the most imaginative kitties we've met. She loves her toys, cuddling, rolling around on her back, and food! She dunks the favored toys in her water dish for extra fun, and has no trouble communicating her wishes to "her people". Thank you for helping us find the perfect addition to our home. I just wanted to give you an update on Abraham adopted 1/12/08. On the ride home we renamed him Hoodoo after one of our favorite casino slot games Hexbreaker where Hoodoo is sort of the hero that helps you "win" big. Anyway, Hoodoo is a great little guy. He loves to run full speed around the house which sometimes leads to a crashing stop. He loves being picked up, pet, combed, having his belly rubbed, ears rubbed, basically any kind of pampering. 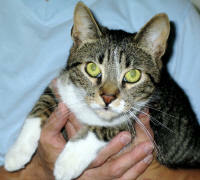 He loves to help fold laundry and loves keeping Lucky and Petunia (adopted 10/28/06) on their toes. But most of all he loves us and we love him right back! It has been nearly 9 months since we adopted our sweet Zoe. She has developed in the most delightful pet...no longer quiet and shy... but curious, energetic, playful, and amusing! Zoe had her wellness check up earlier this month and weighs in at 10 pounds and appears healthy. Unfortunately, in August, she was diagnosed with asthma. She has had an asthma attack every month since we adopted her, but the episodes last less than 1 minute. Her vet does not want to put her on medication yet, but we are monitoring the frequency and severity of each asthma attack. I always felt as if Zoe had been waiting that long year at the Pat Brody Shelter for Cats just for us to adopt her. From the moment I saw her photo on petfinder.com, I knew she was meant for us. You may recall that I visited her 3 times before I brought her home...each time, she hissed at me and scratched my hand, bloody. But I knew she was the one for us. Since her asthma diagnosis, I now am certain she waited for us. 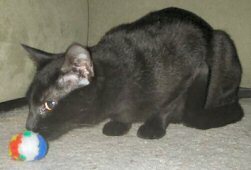 Our beloved cat, Toby, who passed away in 2007 was diagnosed with asthma at 6 months. Later Toby was diagnosed with diabetes. He lived for 15 years and during that time required medication and oxygen therapy for his asthma and insulin for his diabetes and countless visits to Tufts. So, we are not frightened off by special medical needs. We are committed to providing Zoe with the best medical care possible and we certainly will continue to shower her with love and affection. Zoe is a constant joy! I have attached a few photos of Zoe...she is gorgeous! She is as sweet as she is beautiful and we are grateful to have her with us. Hello. We adopted Oliver (formerly Cosmos) about 1 month ago after losing Leo to renal carcinoma. We were a bit concerned about how Jack (formerly Bashful) would feel about having a 6-month old non-stop moving twister who believes that everything is his personal toy. We are pleased to say that after some initial blinking and "what the heck is it?" attitude, Jack and Oliver get along just fine. Jack does prefer it a bit quieter at times, and will sneak off to the bedroom for some peace and quiet, but the pair has been known to race around the house at 4 AM. Oliver never once showed hesitation and fear. We don't think he slept much in the first week, actually, as there was just so much to see and explore and inspect and chew. The most fun has been checking out the gazillion birds and squirrels that inhabit our yard. The day the gray squirrel was about 18 inches away from his nose...we've enclosed a picture taken on the enclosed "catio" in the yard. Fresh air but protection from everything else. Wanted to take a moment to let you know that Geyser is doing great and continues to straddle, harass and play with my other cat Griffin. Sometimes Griffin gives me the look like "why the hell did you do this to me?" I think he has his moments though when he enjoys him too. So Geyser is a much loved and cared for member of my family and I thank you every day for the wonderful work you do.